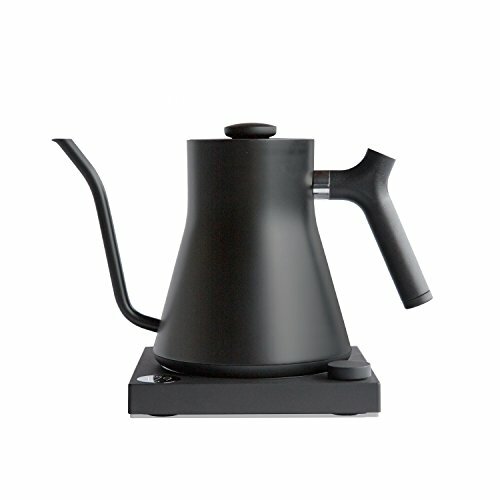 What are those oddly-shaped kettles and why are they great for coffee? Welcome to the world of the gooseneck kettle! 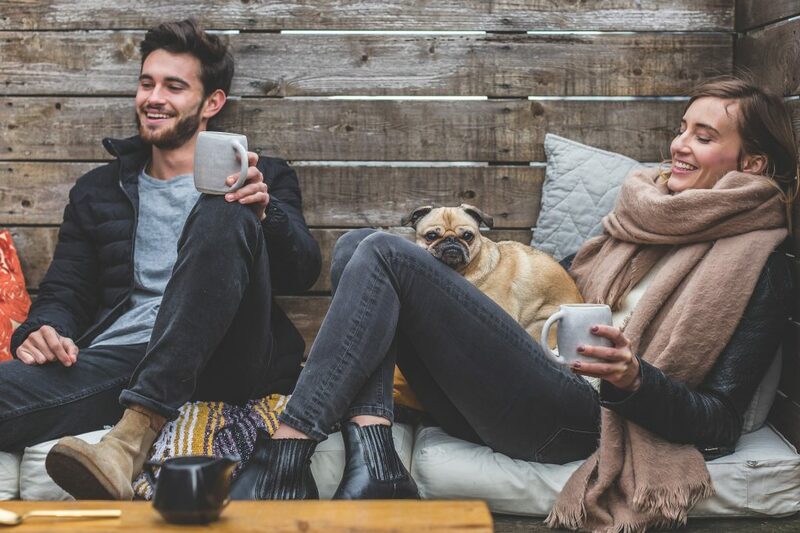 If you’ve only just discovered pour-over brewing, then you’re probably in the market for the best gooseneck kettle to help you perfect your cup of brew. We’ve reviewed the best gooseneck kettle brands on the market so that you can choose the best one for your needs. 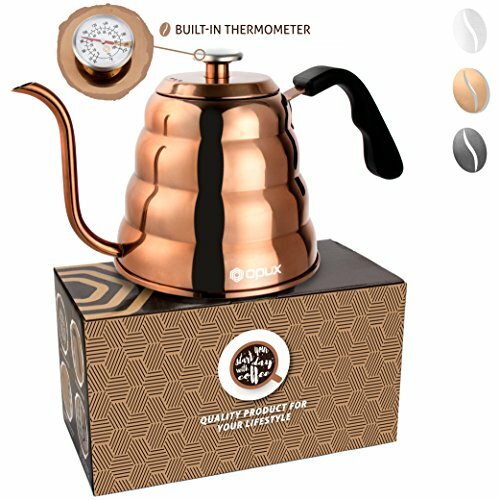 Check out the kettles in our review- we list the features and benefits of each model and share where to buy them. A gooseneck kettle is called such because the spout is shaped like a goose’s neck. The kettle’s unique design stands out and makes it a great conversation starter when you’re entertaining friends at home. Most people call them a gooseneck kettle, but some refer to them as a pour over kettle, because of its function. But there’s more to a gooseneck kettle than just good looks- its functionality helps you brew a better coffee or tea. This is because the spout gives you more control over the flow of water when making a brew. The water pours more delicately, so that it does not impact on the flavor and strength of your coffee and tea. Let’s take a look at the best gooseneck kettle brands on the market- what are the main differences between each model, other than the price? 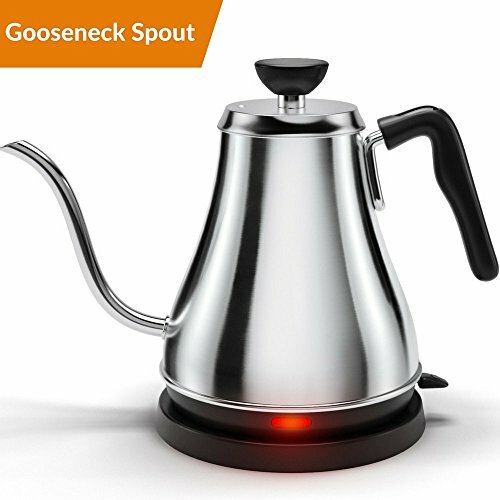 We’ve chosen the Bonavita as the best gooseneck kettle brand because of its features and it’s also the best selling gooseneck kettle on Amazon. We’ve read through the customer reviews and people are very happy with their Bonavita gooseneck kettle. You can set the temperature you want your water to be- you can even choose the exact degree temperature. The “heat and hold” function is excellent- your kettle will keep the water at your exact desired temperature for up to an hour. This means you don’t have to reheat your kettle if you’re making multiple cups of tea or coffee in an hour. This is great when you’re entertaining people and might need to use the kettle multiple times. The kettle’s 1500 watt power makes it heat up quickly. The display shows you what temperature the water is at. There’s also a count-up timer so you can track the brewing process as the water is being heated. The kettle is made of quality brushed stainless steel with BPA-free plastic components. If you’re looking for the “wow factor” when choosing the best gooseneck kettle, you can’t go past the Fellow Stagg EKG electric gooseneck kettle. It comes in your choice of two finishes- matte black (which stands out and looks stylish) or stainless steel. Inside, there is a silicone component that protects the element however the rest of the interior is a stainless steel finish. Although not as powerful as the Bonavita, the Fellow Stagg gooseneck kettle has a quick boil and variable temperature control. It has a built-in brew stopwatch so that you can choose to time your extraction. 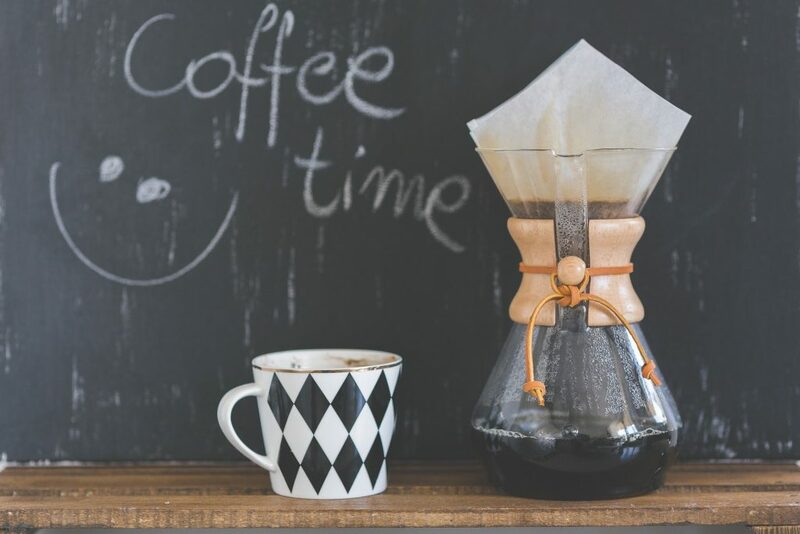 Different coffee and tea flavors require different extraction times. You can also keep the water at the same temperature for up to 30 minutes using the “heat and hold” function. This isn’t as long as the Bonavita, however still a great function for when you want to refill your coffee and tea. Unlike the Bonavita which is a standalone kettle, the Coffee Gator is a stove-top gooseneck kettle perfect for those who don’t want something big or like to take their gooseneck kettle with them while traveling. The kettle is made of medical-grade stainless steel and Coffee Gator prides itself on its quality and customer service. It can be used on any stove top. The kettle has been picked as “Amazon’s choice”, and is a big seller. Coffee Gator has created a triple base of steel, aluminium and steel, to prevent rust. The kettle comes in two sizes- 34floz and 40floz (1 liter max). For warranty information, please contact the seller directly. Copper and rose gold are popular colors at the moment. This is one of the reasons why we’ve picked the Opux Premium gooseneck kettle as one of the best gooseneck kettle brands on the market. It comes in a choice of three finishes- stylish glossy copper, glossy black or stainless steel, and there is also a stainless steel finish with a glass top. There is a thermometer on the lid so that you can keep an eye on the water temperature. If you want to show off your kettle on your kitchen countertop, then we’d recommend the copper finish. The kettle holds 40floz (1 liter) and has an ergonomic handle for easy holding. It is made of medical-grade stainless steel and has a triple base to prevent rusting. Included with the kettle is a cleaning brush designed to clean the gooseneck-shaped spout. The kettle is suitable for all stove tops and is dishwasher safe, making it easy for you to clean. The electric gooseneck kettle by Willow and Everett is another popular seller on Amazon, and comes at a great price. The kettle is made of food-grade stainless steel and all other components are BPA-free. 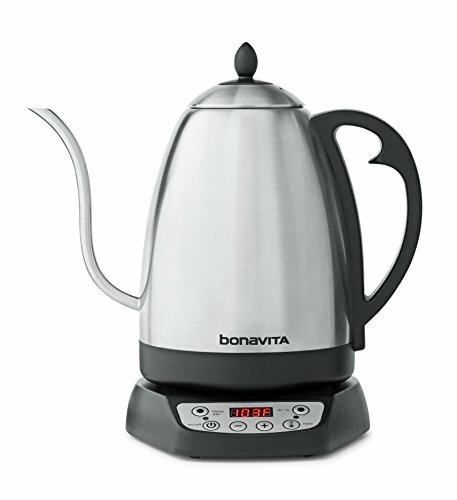 The kettle heats very quickly and once your water has boiled, it shuts off automatically. There are five preset temperature options: 180, 195, 200, 205 and 212 degrees Fahrenheit. It has a 1 liter water capacity and a “keep warm” function that keeps your boiled water warm even after the kettle has finished. The lid has been designed so that it’s spill-proof. Willow & Everett donates proceeds from the sale of their kettles to charity. Why use a gooseneck kettle? 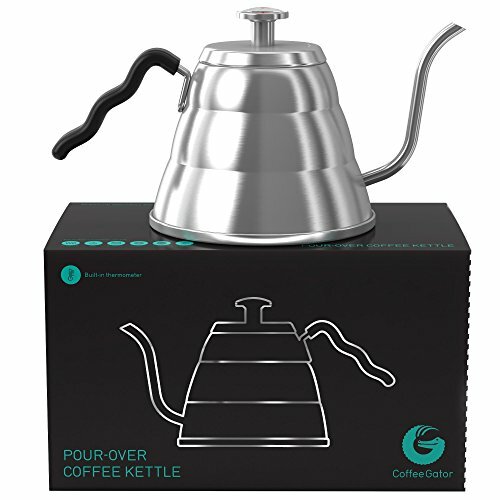 You would use a gooseneck kettle whenever you are making a pour-over coffee or tea. Rather than using a traditional kettle, a gooseneck is easier to handle when pouring the water into your coffee or tea cup. The narrow, long spout slows down the water flow so that it gently pours into your cup. You also don’t need to tip the kettle over as much as you would if you were using a traditional kettle. Plus, a gooseneck kettle looks unique- it’s a conversation starter in the kitchen! Everyone will want to know about it, and have a go at pouring. Many gooseneck kettles have a function that keeps the water at the same temperature for 30 to 60 minutes. This is great if you need to pour multiple cups of tea or coffee and don’t want to re-boil the water. The unique shape of the gooseneck spout makes it tricky to clean, but you can purchase a special cleaning brush that’s designed to fit inside the spout. Some kettle brands come with a free brush. Other than the special brush for the spout, you can clean your gooseneck kettle just like you would your traditional kettle. Gooseneck kettle vs regular kettle: what’s the difference? A gooseneck kettle allows you to set the temperature that you want your water heated to, and it can stay that temperature for up to an hour with some of the gooseneck kettle brands. A regular kettle doesn’t have the option to do this. A regular kettle pours water quickly- you have no control over the water flow. A gooseneck kettle has a slow water flow and you don’t need to tip the kettle over as much as you would a traditional kettle. A gooseneck kettle is designed for those who love crafted coffee and tea. Ok let’s just say it- it’s for a coffee snob! 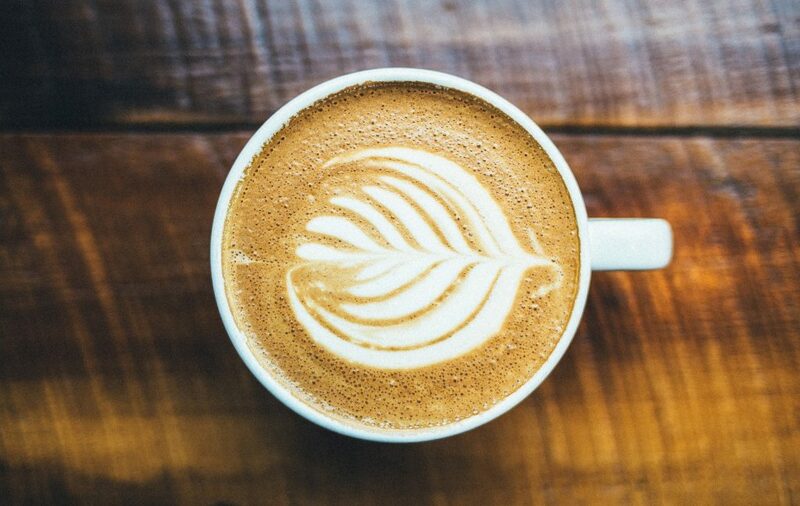 Admit it- you consider yourself a barista when your friends are over. You love showing off your brew making skills. Of course you’d want a gooseneck kettle! Making a pour-over coffee is different to an immersion coffee (when you just pour water into a cup with coffee). 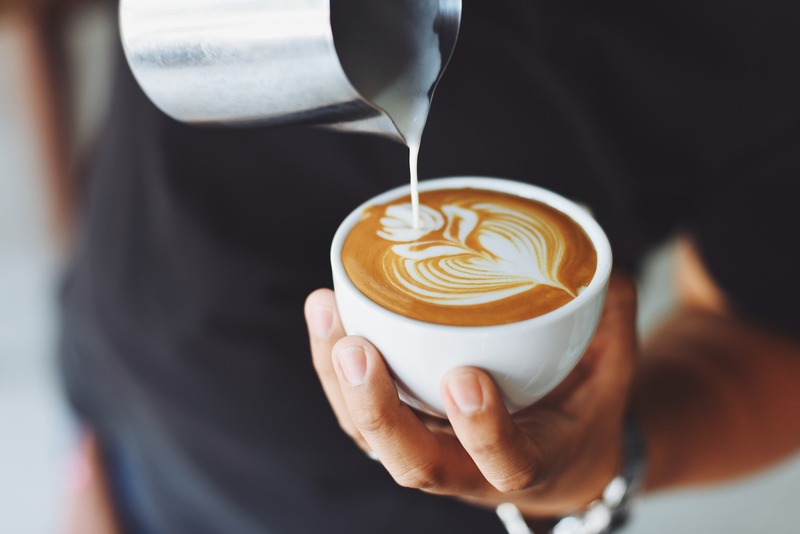 With a pour-over coffee, you want the water to gentle pour over the coffee beans so that it extracts the right amount of flavor and richness. There aren’t many differences between each gooseneck kettle, other than the following that you should consider when making your choice. A stove top means that you would need to place the kettle on a stove for it to boil. The kettle isn’t electric, so it doesn’t have wiring or a plate to sit on. You need to make sure that the brand you choose is suitable for the type of stove you have. An electric gooseneck kettle can be connected to your power point- you don’t need a stove. There are different sizes of gooseneck kettles- you need to decide what size is important to you. Will you make many cups of coffee and tea each day? How many people live in your household? Do you entertain a lot? Will the kettle be use at home or at work? These are some things to consider when choosing the right size. Although the gooseneck spout is the same on all brands, there are different design elements to choose from. Do you prefer sleek stainless steel? Do you like the sturdy look of matte black? Do you like copper, which stands out on your countertop? These are personal preferences! Think about what design you like most and what would look good on your kitchen countertop. The more power that a gooseneck kettle has, the faster it takes to boil your water and the longer it can stay warm in the kettle. 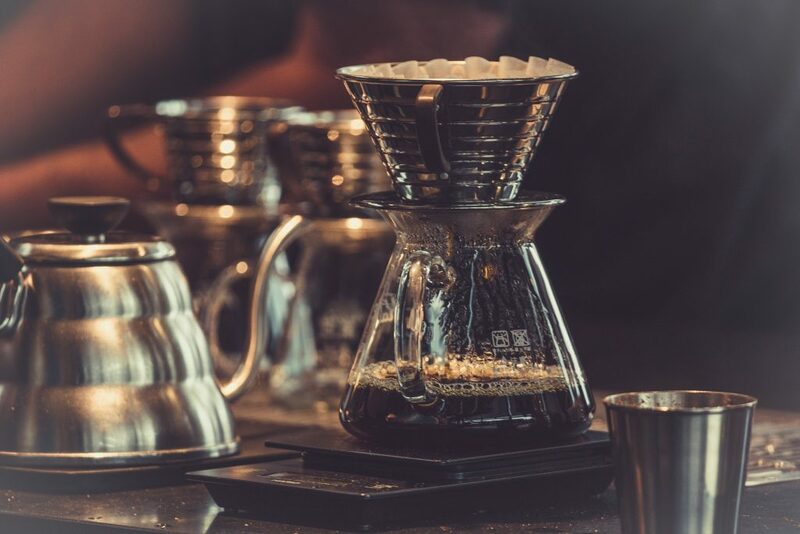 Manual brewing is as much about the experience of brewing as it is about the finished cup of brew. To fully enjoy the experience of manual brewing, use a gooseneck kettle that will help improve the flavor of your coffee or tea. 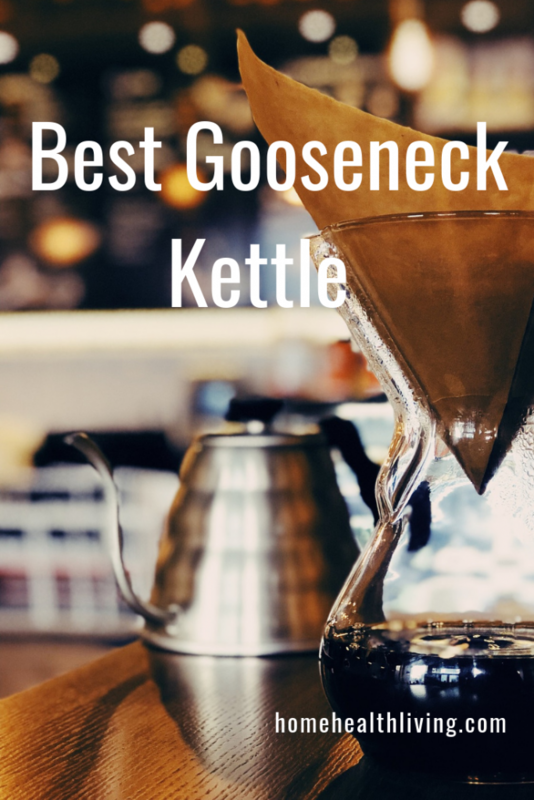 We hope our reviews of the best gooseneck kettle for pour over coffee will make it easier for you to make your buying choice.